Apple’s new slogan for the recently introduced iPhone 6s and iPhone 6s Plus is “the only thing that’s changed is everything”. There are some nice features introduced although I’m not sure that everything has changed. Fortunately the size of the phone has, for the most part, stayed the same. That’s great news for readers that have taken our prior advice and went with a universal cradle mount for previous generations of iPhone because your new iPhone 6s or iPhone 6s Plus is going to fit your current mount and you can stop reading here. For those that are new to mounting their smartphone in their vehicle or simply want a new mount, read on. When it comes to mounting this phone, it’s important to know the dimensions of these devices. The iPhone 6s is larger than any model announced to date. Similar to it’s older sibling, the iPhone 6 in size but with a very small change. With a 4.7 inch diagonal screen this phone is 5.44 inches tall by 2.64 inches wide by .28 inches deep. The iPhone 6s Plus is even larger. Sporting a 5.5 inch diagonal screen, this iPhone is 6.23 inches tall, 3.07 inches wide and .29 inches deep. These are important measurements to keep in mind when selecting your mount. I am thinking with such a small difference in size, any custom cradle made for an iPhone 6 will fit the iPhone 6s. For those with a custom iPhone mount which features a cradle specifically made for any iPhone other than an iPhone 6, they aren’t going to fit and you will need to purchase a new mount, or at least a new cradle. For those that have purchased a universal mount to hold your older phone, hopefully it opens wide enough to hold your new iPhone 6s series without a problem. Most universal mounts offer options to upgrade your cradle to a larger one. From experience, I suspect you will be able to reuse your existing universal mount for an iPhone 6s, but not for the iPhone 6s Plus. The iPhone 6s Plus is a really big phone. It was made to compete with the larger models from Samsung such as the Mega and Galaxy Note. Thanks to the HD retina display and faster processor, the new iPhone 6s and iPhone 6s Plus is going to work well with GPS applications such as Waze. The most popular location for mounting your phone remains the windshield. The Arkon Windshield and Dash Mount continues to be my favorite for mounting smartphones. The included cradle opens to 3.4 inches so it’s large enough for both the iPhone 6s and iPhone 6s Plus. The included suction cup mount features a vacuum grip that’s activated with the handle at the base. Your phone can swivel and pivot as needed. There is an included adhesive dash disk to facilitate mounting to your dashboard. This is a great addition for drivers in states that do not permit windshield mounting. Although the windshield is the most popular location for mounting, there are a lot of other locations in a car that I think are even better locations for your smartphone. The Arkon SmartPhone Vent Mount is a great mount for placing your phone on the air vent. This mount features the same cradle as the previously mentioned mount. It will attach to your vent slats using a pair of arms that grab onto the slats and works best in cars with horizontal vents. I like these because it places the device near the eye level of the driver yet it’s not as visible as a windshield mount so it stays out of the view of potential thieves plus these are great solutions for those living in those states where windshield mounting is not allowed. Ever notice that your CD player isn’t used any longer? That’s because everything is loaded to your phone and it’s now streaming via Bluetooth to your car’s audio system. Why not use that worthless CD player slot as a mounting point for your phone? 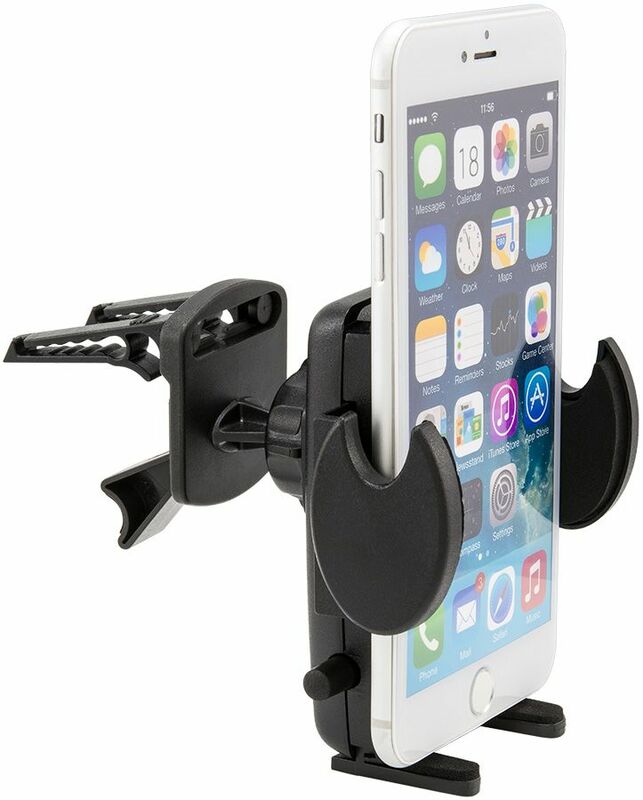 The Satechi Universal Smartphone CD Slot Mount features a universal cradle that will fit your iPhone 6s or iPhone 6s Plus. Included are 3 pads of varying thickness which are used to ensure the mount fits into your CD slot. It has an expandable cradle with padded arms to fit both the iPhone 6s and iPhone 6s Plus. When it comes to motorcycles, it’s alright to deviate from my typical universal cradle recommendations. There is no better stability and safety than a well fitted custom cradle for your phone. An excellent manufacturer of custom cradles for all models of iPhone has been RAM Mounts. Given the millimeter difference in size of the 6s series versus the older iPhone 6 series, I suspect their custom cradles will fit well, but as of date of this publication, do not know for certain. I will be updating this article with the information as soon as possible. In the meantime, you can take a look at the RAM-HOL-AP18U which is made to fit the iPhone 6 and the RAM-HOL-AP19U which fits the iPhone 6 Plus. Since these are custom cradles, these aren’t going to fit your phone if it has a case or skin. Naturally, the universal cradles from RAM will fit these phones quite well. The RAM X-Grip cradles have been a favorite for a long time and you can read our overview of this series. These are heavy-duty mounts that are mostly constructed of metal. The mount has gone through some rigorous shake tests and holds up well on a motorcycle. The RAM X-Grip Motorcycle Handlebar Mount combines the X-Grip cradle with a metal motorcycle mount that fits up to 1.25 inch handlebars and features two adjustment points with the ability to pivot and swivel. The iPhone 6 Plus needs a larger cradle so you would select the RAM X-Grip IV Motorcycle Mount. Both of these mounting kits expand sufficiently to handle your phone with or without a case or skin.